The language of Bangladesh, West Bengal and parts of Tripura and Assam, Bengali is the sixth most spoken language in the world. A member of the Indo-Aryan family, with its origins in Sanskrit, it has over 230 million speakers. 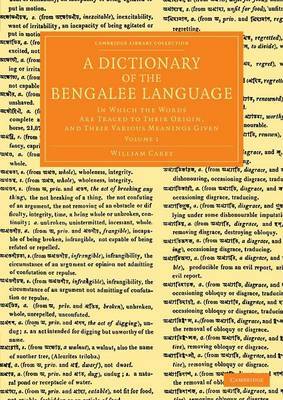 Published in 1825, this is the first volume of a revised three-part dictionary of Bengali, compiled by the Baptist missionary William Carey (1761-1834) during his time in India. Its purpose was to assist Carey's European students at Fort William College in Calcutta, and he endeavoured to include every simple word used in the language, along with all the compound terms found in Bengali literature. Containing over 100,000 entries in Bengali script with English translations, and providing etymologies for most words, it remains of great interest to linguists today. Carey's reference works on Marathi and Sanskrit are also reissued in this series.